While that sounds simple it isn’t always easy! Sometimes atrocities happen in life caused by the actions of another person. Those are extremely difficult situations to forgive … and yet it has been proven that forgiveness in those horrendous situations actually sets the victim free, not the offender. There are situations where it seems crazy that someone could feel that they were wronged. Whether it is the slow clerk at the grocery store, the 16 year-old kid taking your order at McDonald’s, or someone who cuts you off in traffic, some folks take these actions as personal assaults. We all know people who hold onto small petty things that happen in everyday life because they believe they were offended. Even though the actions of the other person have absolutely nothing to do with them! And then there are those situations involving ourselves. I help individuals who get stuck and don’t know what to do next to move to the next level of success in their career, their business, and their life. Sometimes what is holding them back is an imaginary glass ceiling that keeps them stuck in a place they don’t want to be in. In most cases I find that somehow their level of success is directly tied to their sense of self-worth and value and they don’t move forward until they let go of some old beliefs that are holding them back. Sometimes those old beliefs are about something that someone did or said to them a long time ago. Sometimes it is about something the other person did not say but they needed to hear. It could be a parent, sibling, relative, ex-spouse, 1st grade teacher, etc.. Either way it keeps them stuck until they’re willing to experience the act of forgiveness and let go. Sometimes the person that needs forgiveness the most is themselves. Poor choices in the past, old beliefs, or experiences, can keep a person tethered to a stake in the ground like a circus elephant who can only move in circles and never moves beyond the length of the rope. The crazy thing is that those old beliefs and ideas are not true. They are not the truth about us or who we are but they keep us stuck walking in circles. Even though we have the power to cut ourselves loose, we choose to stay right where we are. 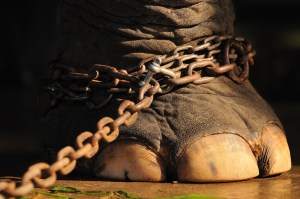 Just like an elephant, when they remove the rope, the animal can move freely but they choose to stay in the same area , as if they were still tethered out of habit and what they believe to be true … I can’t move, I can’t reach, It’s not safe, I don’t deserve it, etc. Is Forgiveness Holding You Back? Do you need to let go of some past hurt or act caused by another person that has you believing you don’t deserve more? Do you need to forgive yourself for a past mistake, failure, or a bad decision you made that has you tethered by an invisible rope that only you can cut? Yes, it might be simple but not easy … if that’s what you believe. Just remember it will be difficult … until it’s not! PreviousPrevious post:Do You Want Success or Significance?NextNext post:Listen … Do You Want To Know a Secret?